Agar App Online Watch Buy Karna Chahte Hai to Aapke Liye Hai Ek Best Paytm Mall Shopping Offer. Jise Aap 139 Rs Ki Watch Only 39 Rs Me Buy Kar sakte Hai Yani 100 Rs Ka Cashback ! 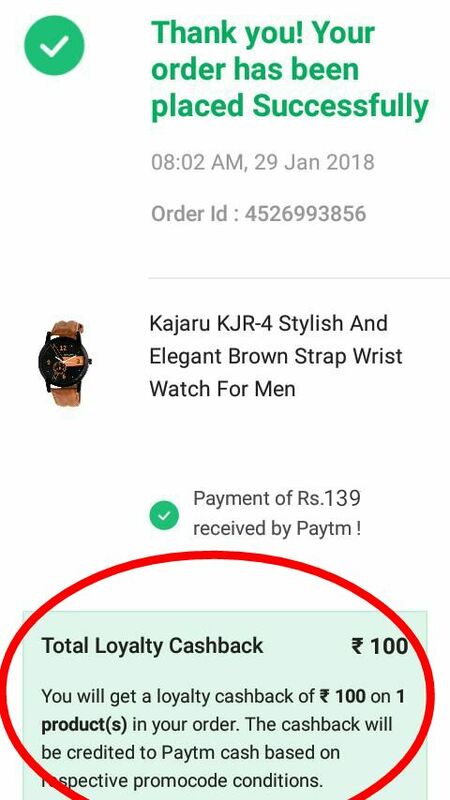 So Let's Know Paytm Mall Se 39 Rs Me Watch Buy Kaise Kare ? Abhi Paytm Mall Shopping Offer Chal raha hai. Jise Aapko 150 Rs ki watch Buy Karne Par 100 Rs Cashback Mil Raha hai. 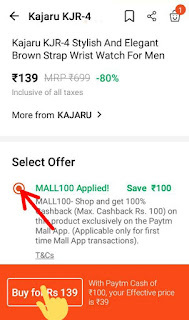 Ye Badhiya Paytm Mall Cashback Offer Hai. So Let's Follow Step by step How To Buy Watch In 39 Rs From Paytm Mall.Shopping Offer. * 100 Rs Cash back Paytm Mall First Time Transaction Pe He Milega. * Agar Paytm Mall Se Pehle Koi Recharge, Shopping Ya Other Transaction Kiya He To Promo Code Apply Nahi Hoga. Step:1 First Play Store Se Paytm Mall Install Kare. 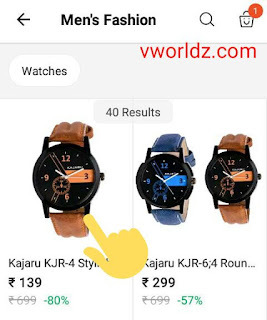 Step 3: Serch Box Me Kajaru KJR-4 Search Kare Or First Watch Select Kare. Step 5: Next Page Me Dilevory Address Add Kare. Now Paytm Se 139 Rs Ka Payment Kare. 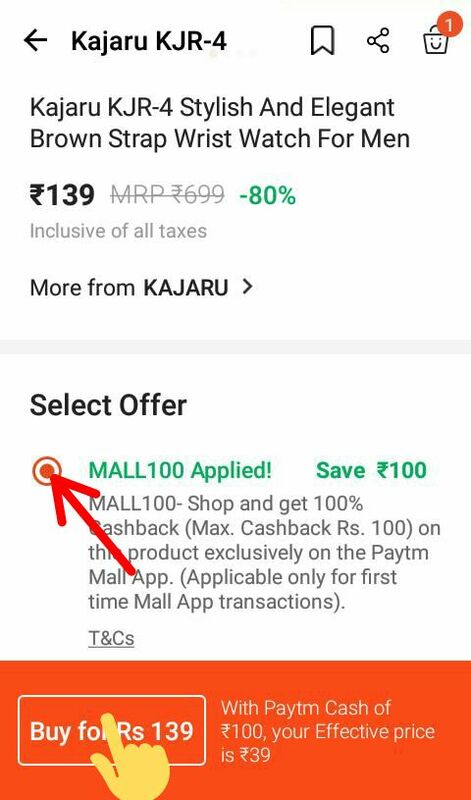 Payment Karne Se Pehle Confirm Kare Ki "MALL100" Promo code Apply Hua He Ya Nahi. Payment Karne Ke Baad Aapko Order Confirmation Ka Page Show Hoga. Niche Diye Image ko Dekhe. Ab Aapka Order Successfully completed Ho gaya Hai. Last Me Aap Loyalty Cashback Rs 100 Bhi Show Hoga. Abhi Full Payment 139 Pay Karna Hai, Baad Me Aapki Watch Ki Dilevory Hone Ke Baad 24 Hour's Me Aapko 100 Rs Cash back Mil Jayega. Yani 139 Rs ki watch Aapko Only 39 Rs Me Milegi !! To Is Tarrah Aap 39 Rs Me Paytm Mall Se Watch Buy Kar sakte Hai I Hope Aapke Liye Ye Post Helpfull Rahi Hogi, Agar koi Problem Aa Raha hai to Comment Kare. Or Agar Aapka Order Complete Ho Jaye To Jarur Se Comment Kare. Is Post Ko Apne Sabhi Friends Ke Saath Share Kare...Thank you. 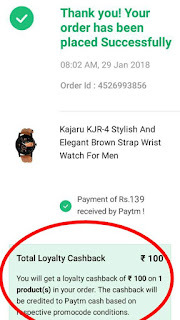 0 Response to " Buy Smart Watch In Only 39 Rs Exclusive Paytm Mall Shopping Offer Loot"